It's Facebook Fridays! for September 4, 2015, and we want to bring you the luck, power, and protection of Dragon's Blood! The Lucky Mojo Curio Company is hosting a random drawing to give away 9 Dragon's Blood Spiritual Supply prizes for warding off evil and bringing good luck in money and love. 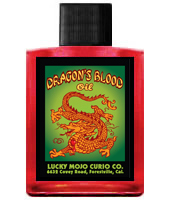 This week the prizes are 9 hand-made bottles of Lucky Mojo brand Dragon's Blood Oil. First thing tomorrow morning, we will select NINE winners at random, announce their names here, and ask them to message this Facebook Page with their mailing addresses, so we can send them their FREE Dragon's Blood products. We have a winner! In fact, we have 9 lucky winners! Our Facebook Fridays! winners for September 4, 2015 are: Claire Benjamin, Greg Barreras, Susan Hunt, David Koffer, Patricia Parker, Samantha Sanders, Becca Dinger-Tedder, Andreya Allen, and Jason E R Jamerson.